Krementz Egyptian Princess cufflink, circa 1900. In 1866 George Krementz founded the venerable jewelry firm Krementz & Company. Over the next 125 years the firm was involved in nearly every aspect of jewelry manufacture - from costume to fine jewelry, colored gemstones to colorful enamels, cufflinks to tiaras. The jewels created by Krementz & Company were retailed by carriage trade jewelers of the day like Tiffany & Company, as well as small town, mom-and-pop jewelry shops. 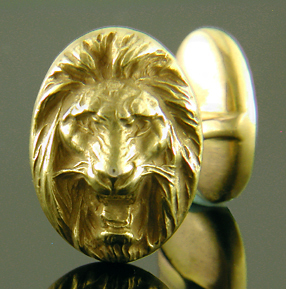 Krementz Roaring Lion cufflink, circa 1900. Among the more captivating of the firm's creations are the "Krementz doubles". Victorian cufflinks often consisted of beautifully decorated oval fronts attached to smaller oval backs with a curved bridge. The oval backs somewhat resembled small beans, so these cufflinks came to be known as "bean backs". Unfortunately, the bean-shaped backs were often left unadorned or merely engraved with the wearer's initials. This left the backs looking somewhat plain and unfinished. Around 1900 to remedy this situation Krementz & Co. introduced a small collection of figural cufflinks with decorated backs. The backs replicated on a smaller scale the design of the fronts or were decorated with a similar theme. Known as "Krementz doubles" these cufflinks reflected the firm's passion for innovative and imaginatively designed jewels. An example of a decorated bean back is pictured below. 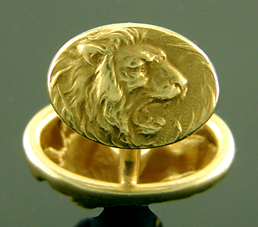 Reverse of Roaring Lion cufflink. Krementz doubles were created for only a brief period around 1900. The cufflinks are beautifully designed, richly detailed, and impeccably crafted. They are somewhat rare and highly desirable. This note illustrates some of the Krementz doubles I have had the pleasure of working with. I hope you enjoy them as much as I do. 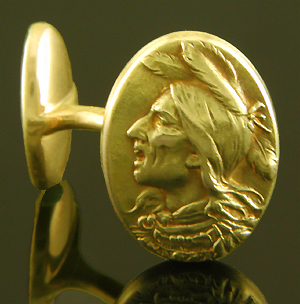 Krementz Native American cufflink, circa 1900. Krementz doubles are figural cufflinks. That is, they featured wonderful reliefs of roaring lions, mermaids, writhing serpents and other subjects drawn from fantasy and nature. I have not yet come across a Krementz double embellished with an abstract or merely decorative pattern. This cufflink of a Native American in song is a nice example illustrating richness and artistry of the designs. 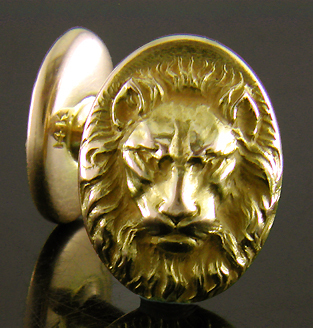 Krementz leonine double cufflink, circa 1900. 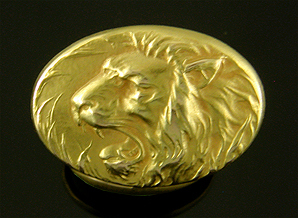 Among Victorian and early 20th century cufflink makers roaring, menacing lions were a favorite subject . Krementz & Co. was no exception. In this note I have illustrated two Krementz doubles with dramatic images of roaring lions - the 3/4 profile lurking in the grass pictured above and the fierce full-faced version illustrated earlier in this post. At the end of this note is a third leonine cufflink, this one created by another eminent cufflink maker of the early 1900s, Link & Angell. 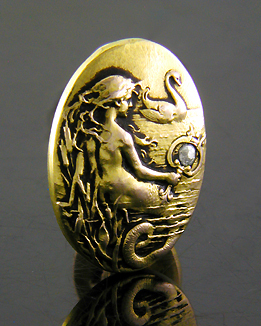 Mermaid and Swan cufflink, circa 1900. In the years around 1900, the free flowing, otherworldly designs of Art Nouveau flourished and Krementz & Co. was one of the first American jewelry makers to embrace the new style. 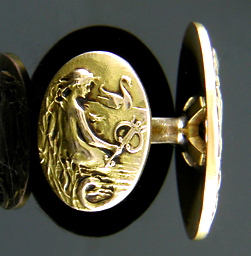 It is not surprising that Krementz doubles often reflected the prevailing enthusiasm for Art Nouveau design as seen in the wonderful Mermaid and Swan cufflink illustrated above. The Egyptian Princess cufflink illustrated at the top of this post offers another striking example. In other doubles the Art Nouveau influence is more subtle, often seen in the flowing hair of the subjects or in the foliage and wind blown grasses in the background. It is not mere coincidence that the short-lived reigns of the Art Nouveau style and Krementz doubles were largely coincident. Krementz serpent cufflinks, circa 1900. This final example of a Krementz double features entwined rattlesnakes. Among the Victorians entwined or coiled snakes were symbols of good fortune and long life. I suspect this interpretation may not apply when the snakes are venomous rattlers. The influence of Art Nouveau is seen in the scaly bodies of the snakes as they twist to form the outer edge cufflink, as well as in the sinuous vines that twists around the bodies of the snakes. As with all Krementz doubles the scene is beautifully and richly rendered. Link & Angell double cufflink, circa 1900. 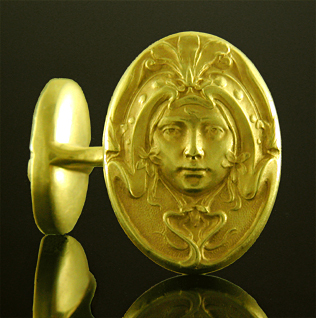 Krementz & Co. was not the only maker of figural cufflinks with decorated bean backs. Pictured above is a leonine example created by Link & Angell, another fine jewelry maker. In fact, I am not certain that Krementz was the first cufflink maker to employee decorated bean backs: the origin and first use is yet to be discovered. But, what is clear is that Krementz & Co.with its passion for innovation and beautiful design was the leading maker and populariser of these captivating cufflinks during the early 1900s. Back of Mermaid and Swan cufflinks. Further details and images of the above cufflinks can be found by clicking the photographs.